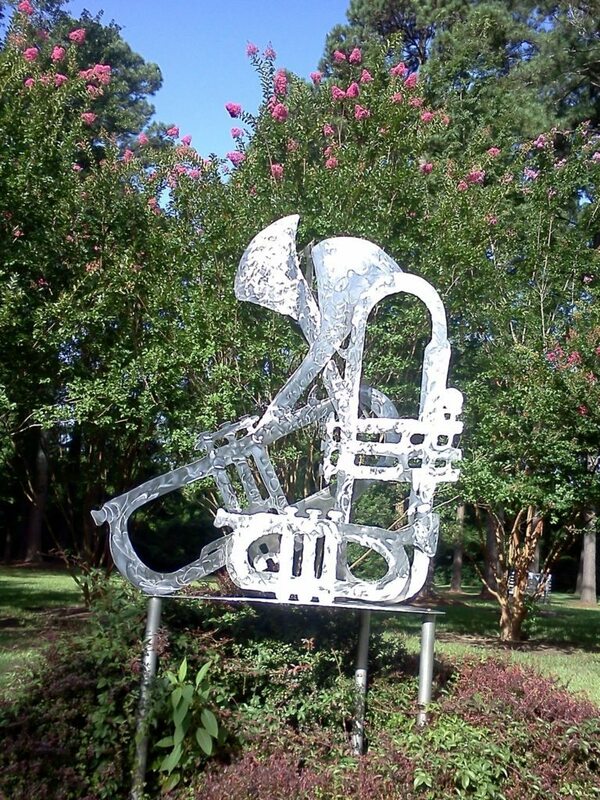 Trumpet sculpture in Dizzy Gillespie Park, Cheraw, SC. I started practicing the trumpet in the park near my home back in 2009, about the time I thought I’d acquired enough control over the horn to avoid embarrassing myself. At times when my lip is tired it will muster too little tension to drive the upper register but too much for the middle one, producing an unspeakable sound that escapes both, something like an amplified fart, but of some animal not yet identified as to class. Bird or mammal? Doing what? Could be a giant condor would make that sound, laying an egg. It is a sound so ugly I instinctively look around me to see if anyone is near enough to have suffered the assault. Mistakes or not, there are plenty of people who object to trumpet practiced in the park, even at its fringes. Once, at one of the remote locations I use, I could hear three vatos – heard them before I saw them — squawking and squalling in a parody of me just before they passed my bench. “Aw… man,” the leader said, as they passed by. “Why don’t you play some tunes?” One of them was shaking his head. I couldn’t blame them. I was at a place where there was plenty of foot traffic, and this much sound in a public place ought to be melodic. That they kept walking wasn’t the only good thing to come out of that moment. I learned to search for musical lines related to the physical exercises, so that it isn’t all just do-re-mi. But for some in the park, the turf issue goes deeper, into proprietary instincts. A little more than two years ago a homeless guy rolled up on his bicycle while I was practicing on the Sixth Ave. side and just stared at me. It was his move, so I waited. After a few seconds he drew breath and shook his head. Though he’s probably 20 years younger than I am, and hostile, he didn’t present a physical threat. “I know you’re practicing…” and here he paused for effect; he wanted to manage the situation. He’d come from some distance to talk to me but was not doing it on time; there was no one as far as I could see when I set up. “I just wonder … why …you’re… here.” It wasn’t a question. “You don’t like it, huh?” I knew it was an edgy remark, but at that moment I’d realized this was an attempt (another one, by the way) to throw me out of the park. I’d decided to dig in. I drew a line on my shirt where the valve repair scar is, and on my pants over the point where my hip was pinned together. And where the hernia was. “I’m not going to do what you want me to do.” The matter-of-factness seemed to work, and he rode off. Of course, I had long ago thought about the consequences of practicing in the park, probably even before I knew just what those might be. I knew I had to take the horn out of the apartment for practical reasons. My neighbors would have complained. The instrument makes too many demands on the player to be satisfied by an occasional 30 minutes of work. The neighbors would have had to put up with daily sessions of what amounts to listening to other people’s televisions. For me it takes a minimum of 90 minutes a day, every day. It’s a very unforgiving sidekick. I don’t know the physics of instrumental sound — what causes the lips to buzz, the buzz to resonate against the metal, the frequency to lengthen as it travels through the horn — but I know the physical side of playing it. You can’t play horns (or saxophones) well enough without using your diaphragm. This is a tough flap of muscle shaped like an inverted bowl that separates the belly and its obnoxious inhabitants from the chest. According to Websters’s New International, Second Edition, Unabridged, it “is a most important muscle in breathing, paturition (childbirth), defecation and other processes,” though they don’t mention air-powered musical instruments. “Hiccups,” it continues, “are due to its spasmodic contraction.” Try to control a hiccup’s blast and you’ll see just how tough that muscle can be. It’s the diaphragm, with the help of the lips, that accounts for the intensity and color of the sound, its loudness and softness. And one of the mysteries is, you can’t play soft without first being able to play loud. If you’re an average player you sound lousy playing soft, but passable when you play loud. Loud playing makes it easier to control the horn, and learn how to get to the soft. So, unless you have basement or a house with insulation, or a room buried in its middle, you take the horn outside. Now, some consequences, owing to human nature. Some people who go to the parks are able to think they invented the spot you’re in just because they found it, or it’s theirs simply because they were there yesterday (like some Germans do at some Mediterranean beaches) or simply through sheer numbers and their own needs that they have a stronger claim on it. I was setting up at the table nearest the Marston House when a couple approached, steadily, meaningfully. There were two empty tables nearby, so I figured they had a question for me. When they drew so close as to require a greeting, I nodded and said hello. I pretended I didn’t understand. “We had our eyes on this table.” He said it with half a smile, no aggression in it. A flat statement of fact, like my own to the scarred guy. “But I’m here,” I answered. “Well,” and he pointed to a black canvas bag, just bigger than a fanny pack, and said they have a few brews they needed to drink in a corner a bit removed. Like some maitre d’espace public I gestured to the next door table. There had to be a few more diplomatic words – what’s in my bag, how long I’ve played, why the spot was valuable to me – to provide cover for them, though I had already regretted not simply picking up and moving. She looked at the bag, dubiously and wanted to see the trumpet. I obliged. And he said to me over his shoulder as they were walking the few paces to the neighboring table, “She was just working me.” So, there I was, the big dog in these few square feet. In reality, the big old dog. I would never have been so bold when I was younger, and, as it turns out, more vulnerable. My favorite CD that Tom Harrell played on is “Horace Silver with Voices”. He got off some great solos on that record. Some of the other CDs under his own name I didn’t appreciate too much so I stopped listening. I saw him once live with Phil Woods in a practice room at some community college. Tom stood off to the side motionless while Phil played. When it came time for his solo, he shuffled over to the mic and it seemed to take him forever to bring the horn up to his mouth. But once there he played brilliantly.